The day after Christmas is celebrated in the United Kingdom as Boxing Day. It doesn't involve fisticuffs, but traditionally was a day when servants and service providers received a Christmas box or other gift or gratuity. 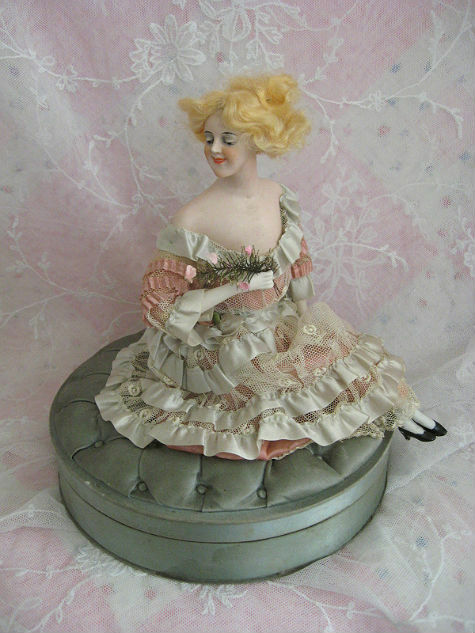 This gracious lady seated upon a silk-covered box would be a welcome gift for any collector. 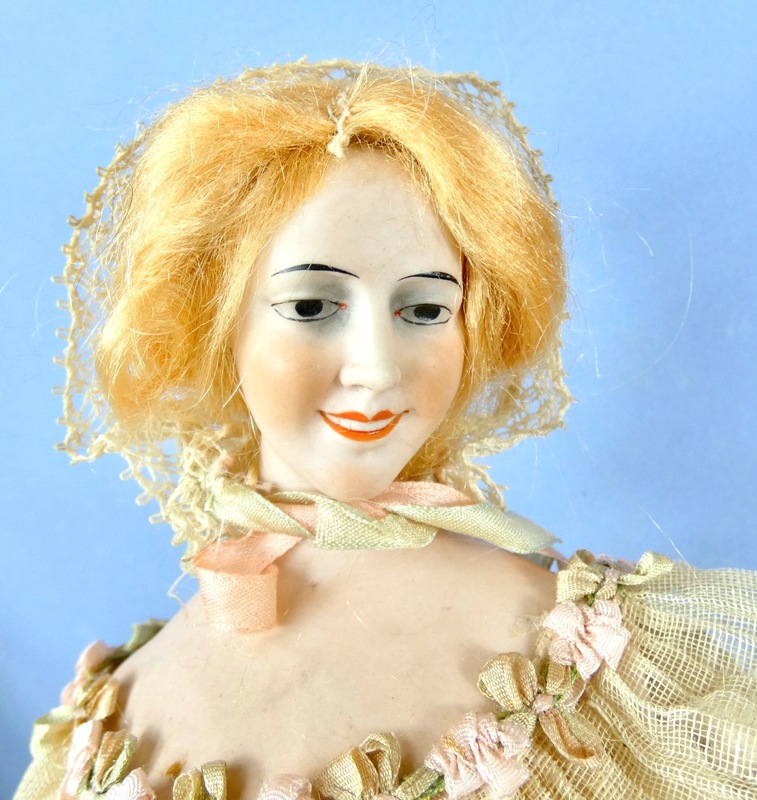 Her bisque shoulder head, arms, and lower limbs are from the German maker Galluba and Hofmann. 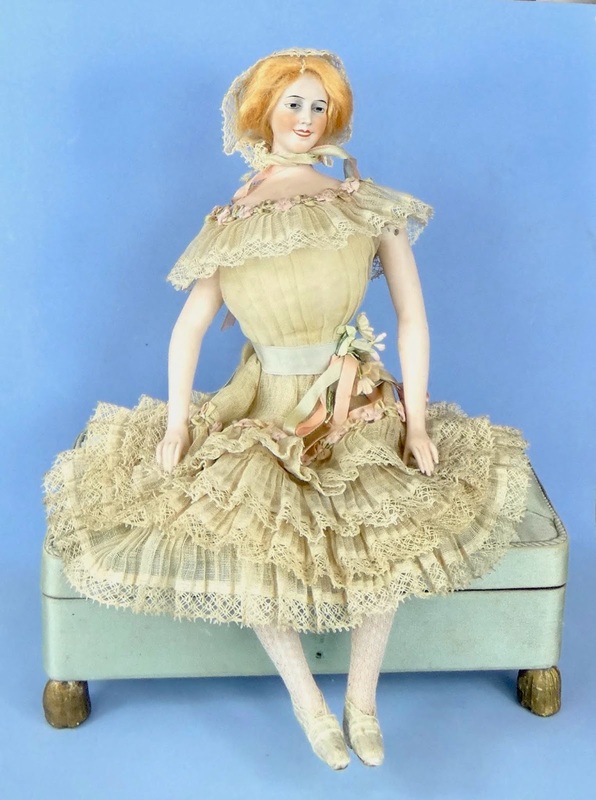 She is on a wrapped armature body and is 10.25 inches tall. Her bench box is wood, lined with cream paper, and covered in silk. The tufted upholstery even has tiny buttons. Her lovely face has what I call the "smokey eye" variation. Instead of the typical Galluba blue eyes with intaglio pupils highlighted with a dot of white and red upper lid lines, the entire intaglio eye is black and the eyes shaded with a sultry gray shadow. Her smiling lips expose tiny molded teeth. 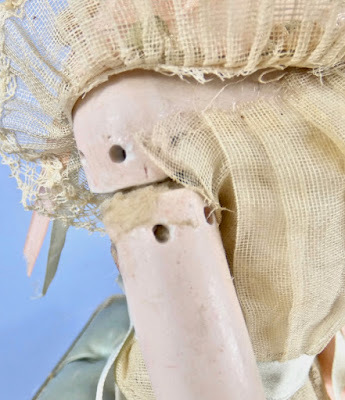 Her clothing is securely sewn and glued in place, but you can seen the unusual holes for attaching the arms and shoulder plate that seems to be unique to Galluba. In this case, however, the arms are attached to the underlying armature and not directly to the shoulder plate. This is not a break, as the edge is finished and you can see the corresponding holes around the edge of the shoulder. 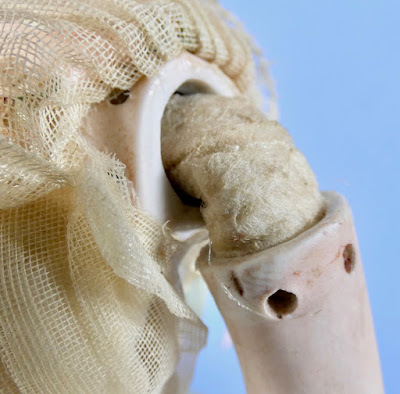 This is a variation of the Galluba shoulder heads that allowed the arm to be attached in a different position. Under the mesh pink stockings you can see that the lower legs have molded ribbed blue socks. One is faintly incised "Germany" at the knee. The shoes are also molded, but have been covered with narrow ribbon and given paper soles. 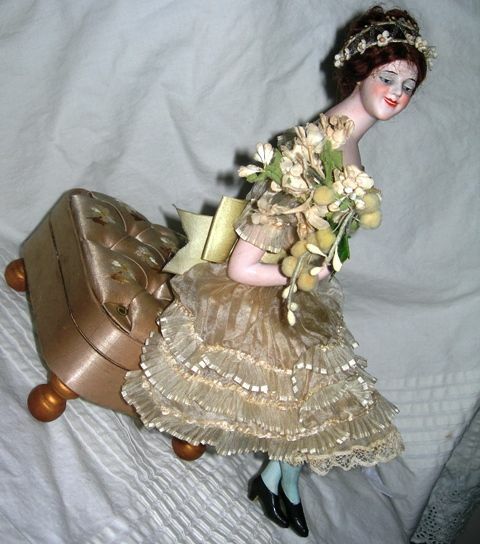 Searching on the Internet, I found two other examples of similar candy boxes featuring a Galluba fashion lady dressed in tiers of lace and ribbon and seated on a silk-tufted candy box posing as a bench or ottoman. 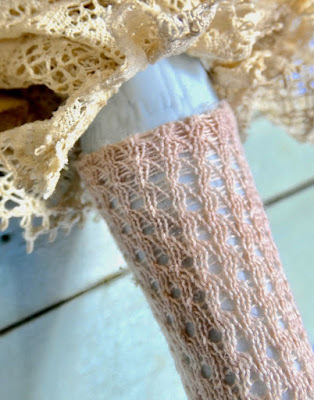 This example is from Pinterest, but had no identifying information. Another beautiful box from Dolls and Lace. Note this belle on a box has a wig of the same blond floss as on my example. Most significantly, she has her original label under her ottoman, stating "Alareine de Fleurs/J Daccard/Limoges/06 Rue de Clocher." J. Daccord was a confiserie (confectionary) store that operated in Limoges, France from the early 1900s as late as the 1960s. And this box is a confection indeed and as sweet a treat as any candy it may have once held. I suspect that Daccord or perhaps some French company bought the bisque shoulder heads and limbs from Galluba and transformed them into these elaborate chocolate boxes. 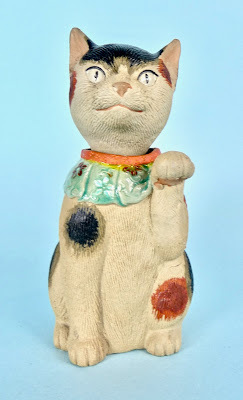 New Posting on my Maneki Neko Page! I have updated my Maneki Neko page with a video of a rare banko ware nodding neko, showing him sagely shaking his head. 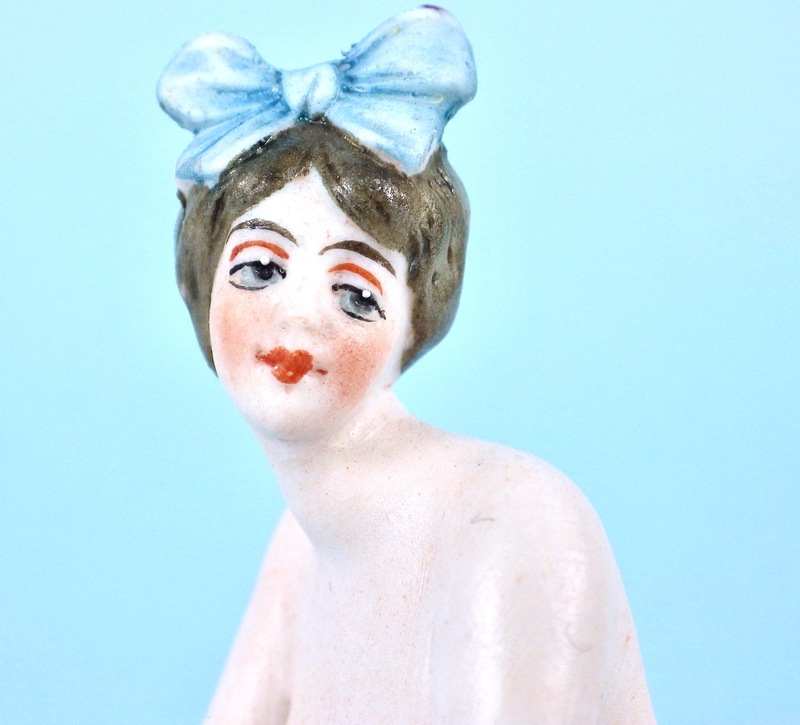 In this season of gift wrap and ribbon, this beautiful belle adorned a big blue bow is most timely. 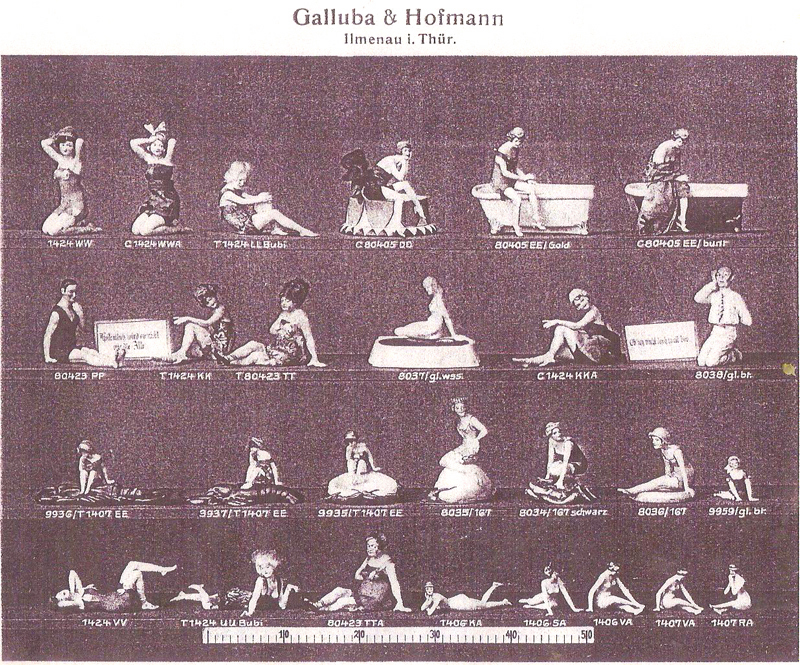 By Galluba and Hofmann, she is an unusual molded hair version of a wigged model. 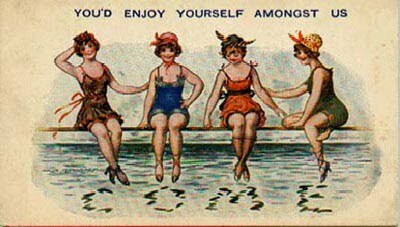 Earlier this blog featured a series of bisque half dolls by Galluba with either wigs or molded blue hair bows and this factory appears to have done the same for some of its bathing belles. Of excellent bisque, this beribboned beauty is 2.25 inches high and 3.25 inches long. Underneath she is incised with a "400" number obscured by an air hole. A close up of her face shows the typical Galluba features, including intaglio eyes with white highlights. Here she poses with a larger wigged version. 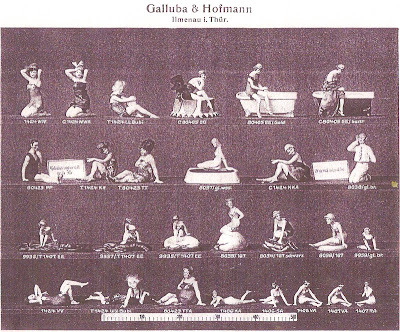 This page from a Galluba catalog appears to feature lovely lasses with molded hair ornaments in the lower right corner.